A “beginners” complementation to PhysicsOverflow? Just a few hours ago I was once again at the Physics Institute of the University of Rostock and I thought I should really nail down a note to announce PhysicsOverflow on the students announcement board there. But of course the handout should not look like kindergarten (as it always does when I try to make one :-/) instead it should look rather cool, fun, but nevertheless some kind of professional. And it should contain the most relevant information of course. Can we design such a nice "official" handout, which can be printed in A4 or A5 and distributed at universities for example? Oh yes, this is a very good idea! I think we should also explicitly encourage all users to post such a pamphlet or handout on their university's notice board. Maybe this thread could also be used to design a small creative advertisement that users could use when promoting PhysicsOverflow on their blog or something. Like the Stack Exchange community ads, they should be small and unintrusive, yet nice and attention-catching. Print the brochure double-sided on an A4 paper and fold it along the faint grey lines. Ensure that the third column on the first page of the word document comes first and the second column of the first page of the word document comes last. The first column of the first page of the word document (which has the third column of the second page of the word document on its other side) should get folded into the brochure if you do it correctly. To attach to a noticeboard, attach tape to the second column of the second page. Please do not print in excess. By the way, it doesn't appear nicely on the google drive default viewer, so please download it to view. @Dilaton It seems the Google drive viewer does not recognise rotation of images. I have converted it into a PDF file on my computer and re-uploaded it. See the updated link. I don't quite understand how the vertical text goes with everything else. I don't know what the "vertical text" is; are you referring to the logo? @dimension10 yes, the logo and the URL. Is there a need to fold it into 3? I don't think there's a need to include anything about the software used in the brochure. A banner to put on your personal homepage. Works in all backgrounds, email me at abhi99.ps at g mail if you want a larger version. I am for some reason not able to add the HTML of the post (despite adding it in visual mode, which means using &lt; &gt; etc.,, and changing the source to have both code and pre and everything, the image renders inside the code. So please right click and click "inspect element" to view the HTML source to add. We are a group of users who are starting a higher-level (graduate-level and above) physics site, called Physics Overflow, outside the Stack Exchange network. In addition to a Q&A section, we will also be releasing a "Reviews" section, in which all papers from ArXiV will be imported, for our users to review. Eventually, we will extend this to journal databases, conference proceedings, important conferences and seminars, and so on. Physics Overflow has graduated from its private beta phase, and is now a full grown website. Hence, we wish to invite all those interested in posting graduate-level questions, giving answers to such questions, etc. to join this website. 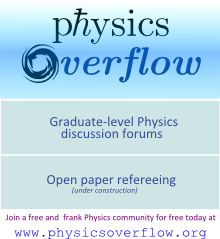 If you are interested in participating on Physics Overflow, you may find us here: http://physicsoverflow.org/. Actually, it's graduated from it's private beta phase and the public beta phase is the phase during which the reviews section is to be developed, etc. Also, the trollsouthere14 should be removed. @dimension10 I edited it. Is it good? It's better, but I think its a little short. By the way, I don't understand the purpose of "(Company)". PhysicsOverflow is completely non-profit and there is not (yet) any organisation associated with it.